In episode 06 we now move the discussion into application. We take the components we have assembled thus far and we discuss what they would look like as a functioning classroom in the flip 101 model. 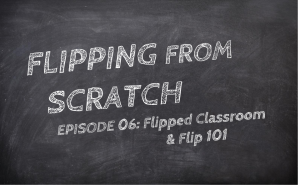 The flip 101 model is what most people would identify as the “flipped classroom”. This model focuses on instruction at home and homework at school, and for many teachers this is the entry point into flipped learning. While this model of flip is limited in its scope and effectiveness, there are times and groups for which this model can be far more effective than the status quo. This model also allows the teacher a structured format in which to learn new skills and evaluate long held opinions.